Hand washing is an extremely important component of infection control as germs picked up on the hands are readily transferred to the eyes, mouth and nose by touching. Keeping all settings clean—homes, healthcare settings, schools and workplaces—is another critical factor in infection control because it helps prevent hands becoming re-contaminated between hand washings. Thousands of gallons of concentrated chlorine bleach and other critical equipment are loaded into the cargo hold of an airplane destined for Sierra Leone, September, 2014. 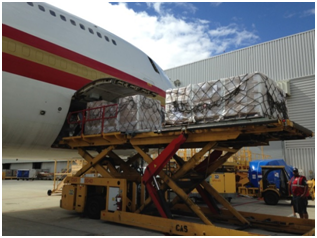 World Vision and the American Chemistry Council coordinated the humanitarian airlift to help fight Ebola. Chlorine bleach was donated by Olin Corporation; domestic transportation services for bleach were donated by CSX Corporation and the Buffalo and Pittsburgh Railroad; bleach bottling services were donated by The James Austin Company. According to the World Health Organization (WHO), “The Ebola virus can be eliminated relatively easily from surfaces using heat, alcohol-based products, and sodium hypochlorite (bleach) or calcium hypochlorite (bleaching powder) at appropriate concentrations.” The Ebola virus can live on inanimate surfaces, especially those that are soiled with blood or other body fluids from infected people. In the later stages of Ebola, when patients experience internal and external bleeding, they may vomit blood or have bloody diarrhea, all potential sources of infection for those around them. As soon as possible after a spill of bodily fluids, clean the affected surface with a standard hospital detergent; then apply disinfectant. This order of operations helps prevent the disinfectant becoming inactivated by organic matter on surfaces. A 0.5% chlorine solution or a solution containing 5,000 parts per million free available chlorine is an effective surface disinfectant against Ebola. 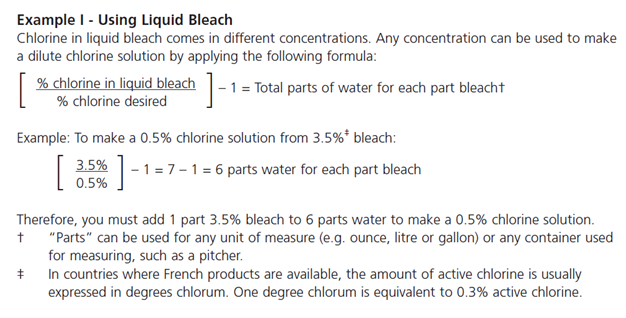 To prepare such a solution from liquid chlorine bleach or solid calcium hypochlorite, follow the directions in Examples I and II below. Note that chlorine solutions have a limited shelf life, and should be prepared fresh daily. Wastes, such as feces, urine, vomit and liquid waste from washing can be disposed of in the sanitary sewer or pit latrine with no further treatment. WHO provides detailed guidance on Waste Management Procedures (see page 9 of the hyperlinked article). Don’t use bleach for everything: If an uninfected person is splashed with the bodily fluid of an infected person, as soon as possible wash the affected skin surface with soap and water. If a mucous membrane is exposed to infected bodily fluid, as soon as possible irrigate with copious amounts of water or an eyewash solution, not with chlorine solutions or other disinfectants. In the rapidly unfolding saga of the West African Ebola outbreak, the critical role of surface disinfection is highlighted repeatedly by public health professionals along with public education, isolation and quarantine, contact tracing, good hygiene and personal responsibility. From sanitizing healthcare environments used for Ebola patient care, to airplanes used for international travel, to homes formerly inhabited by Ebola patients, chlorine bleach proves time and again to be a trusted ally in the raging battle against Ebola. For further information on Ebola, please see the Centers for Disease Control and Prevention website and our article Ebola: What You Should Know. 1 Disinfectants are defined by EPA as either hospital or general use types. Disinfectants destroy or irreversibly inactivate infectious fungi and bacteria but not necessarily their spores. 2 Chlorine solutions of various concentrations are also recommended for machine-laundering contaminated linens, decontaminating equipment such as goggles and visors and even body bags containing Ebola victims.